There’s no astrological season quite like Aries season. It’s unpredictable, wild, and flying at turbo-speed from start to finish. It kick-starts the rebirth of the natural world by beginning on the first day of spring and makes everyone rethink their identity and who they are. The motto becomes “I think,” “I feel,” and “I am,” because Aries is all about making its mark on the world. 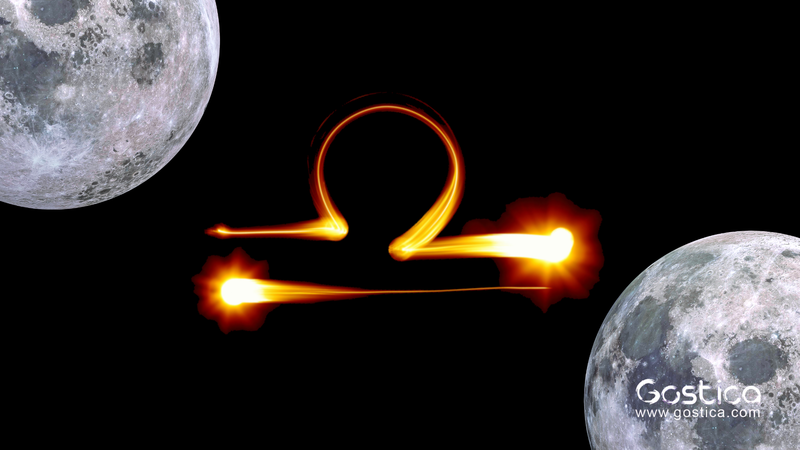 This should all have you sitting on the edge of your seat already, so get this: There will be two Libra full moons during Aries season 2019 and it’s going to be a roller coaster ride of thrills. If you’re at all familiar with the energy of Aries, you’d know that expecting it to tone down its power is unrealistic at best. This zodiac sign is made of cardinal fire, and whatever it touches is set aflame. Aries is the fire of pushing, pulling, and never giving up. Any time the sun is in Aries is bound to be an uncontrollable time, so imagine my reaction to the news that Aries season will literally begin and end with a full moon. Intense, much!? My hearts racing just thinking about it. Let’s not forget that a full moon is a seriously emotional and overwhelming time because it’s when you get to experience the culmination of all your feelings. Because this lunation always occurs in the opposite zodiac sign of the sun, both of these full moons will take place in balanced, harmonious, and partnership-oriented Libra. While this is not technically a blue moon, it’s even more interesting. Even though both of these full moons take on the balancing and cooperative energy of Libra, these astrological events could not be more different. For one thing, the first full moon will take place during Mercury retrograde in Pisces, making for an irrational mindset and difficulties during communication. However, it will form a beautiful trine with determined Mars, giving everyone a boost of courage that will help you take a leap of faith. It will also form a trine with transformative and spiritual Pluto, making this an incredibly healing time full of deep connection and compassion. On the more complicated side, this full moon will form a square with expansive Jupiter, which will encourage you to make decisions that feel good in the short term but have negative consequences in the long term. Keep this in mind so that you don’t do anything that you may regret. The second full moon in Libra will probably be a far more intense full moon than the first one for so many reasons. For one thing, it will take place during the final hours of Aries season and it will land at 29 degrees, which is an incredibly critical time of heightened energy in which every situation in your life will likely feel more pronounced. But, that’s not all. This full moon is forming several aspects with several different planets. Forming a square with dark and obsessive Pluto, you may feel overly defensive and protective of yourself, which can translate into the impulse to react irrationally. Prepare for your more uncomfortable feelings to float to the surface. This full moon will also square karmic Saturn and oppose unpredictable Uranus. You may feel guilty for decisions you’ve made in the past and ready to make better choices going forward. However, there will likely be twists and turns in your situation that you weren’t expecting. On the positive end of the spectrum, this lunation will form an optimistic sextile with a happy Jupiter, allowing you to see the bright side of things. Mercury will also have stationed direct, which means that most of the confusion of its retrograde will be gone. This makes it a fabulous time for inspiring conversations and exciting plans to take place. This was originally published by Elite Daily.